Graveside Services will be 1:00 PM Saturday, March 16, 2019 at Fairview Cemetery, Nancy, Kentucky. Visitation will be 10 – 12 Noon Saturday, February 23, 2019 at the Calvert Funeral Home, Clinton, Il. 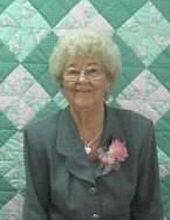 Emma was born May 16, 1923 in Norfleet, KY the daughter of Elmer and Mary Catherine (Dalton) Roberts. She married Winfield Burton, March 20, 1941. He passed away October 27, 2005. Survivors include her son, Thurman W. (Sandy) Burton, Batesville, AR; daughter, Evelyn (Woody) Wilson, Clinton, IL; 7 grandchildren; 15 great grandchildren; 4 great-great grandchildren. "Email Address" would like to share the life celebration of Lou Emma (Roberts) Burton. Click on the "link" to go to share a favorite memory or leave a condolence message for the family.